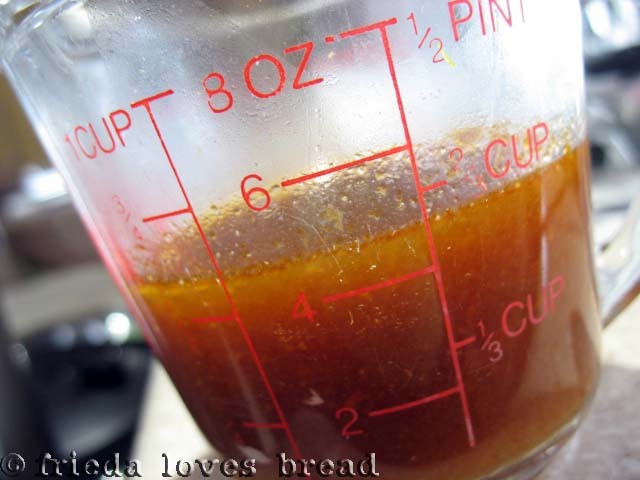 Frieda Loves Bread: From Frozen to Fabulous in 12 Minutes: BBQ Chicken! 18 From Frozen to Fabulous in 12 Minutes: BBQ Chicken! I didn't think it could be done. Frozen chicken cooked to tender perfection in 12 minutes? Let's put my pressure cooker to the test, shall we? 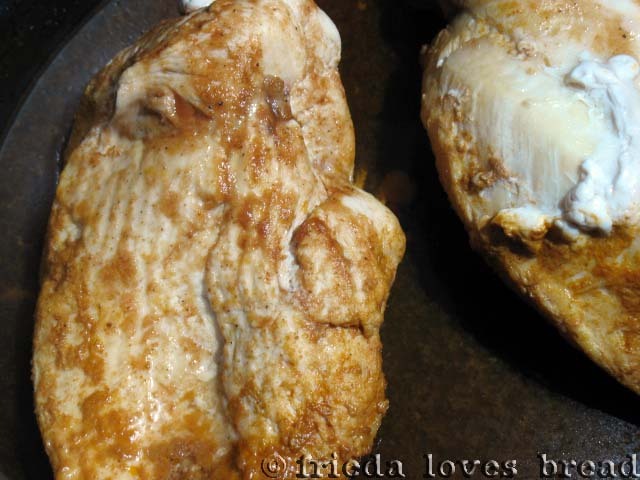 Here's two frozen boneless, skinless chicken breasts. Thunk. Thunk. Update: If you use a thick BBQ sauce, you may need to add 1/4 c. water to your chicken. I added honey to my BBQ sauce and didn't need to add water. 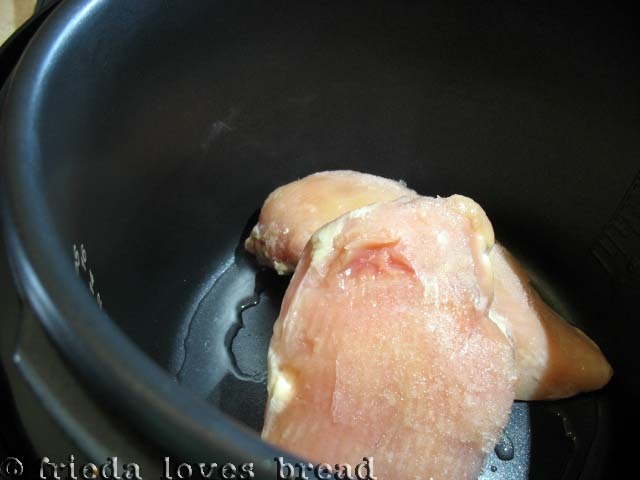 I make plain cooked chicken ALL the time using this method with 1/4 c. chicken broth. The frozen chicken releases a LOT of liquid during cooking and this 1/4 cup liquid is just enough to get the steam started to pressurize your cooker. 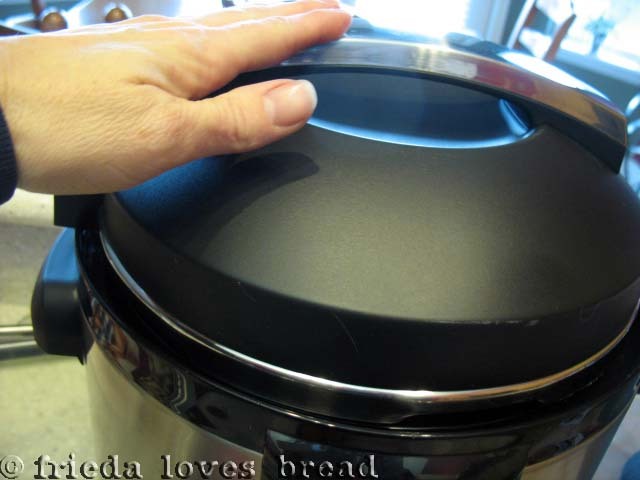 Covered my electric pressure cooker, set it on high pressure, and for 12 minutes. (thawed boneless chicken will only take 5-6 minutes). It took about 7 minutes for the pressure to build and then the 12 minute countdown began. **update: It is strongly advised to let your meats sit for 5-10 minutes after pressure cooking, then do a quick release. Quick releasing right after cooking can create a "vacuum" and take a lot of the moisture from your meats, causing them to be dry and tough. Once the pressure was down (only took a couple of minutes), I could open the lid. Let's take a peek... Not too shabby! This chicken was moist, tender and it shredded easily. I combined it with some of the 1/2 cup or so of BBQ "broth" that was left over in the pressure cooker and served it with cheese on a homestyle tortilla for a quick and easy meal. I think we have a winner on our hands, folks! Dust off your pressure cookers and give this one a try! No time to thaw out your boneless chicken? Put it in your pressure cooker, frozen, and have it ready in less than 20 minutes. Use the weight of your chicken to determine the cook time and use a natural release. Frozen chicken releases some liquids, so at least 1/4 cup thin liquid is required. COOKING CHART - use HIGH pressure, 1 minute per ounce •Up to 6 oz, use a 5 minute natural pressure release (NPR)*6-11 oz, use a 10 minutes NPR•11 oz or larger, use a full NPR•When cooking multiple chicken breasts, keep chicken in a single layer, with no overlapping. Use a tall trivet and/or steamer basket to separate the layers when stacking•Weigh each chicken breast and take the average weight to determine the cooking time. For example, a 10 ounce frozen chicken breast will use a 10 min cook time with a 10 minute NPR.1. Put 1/4 cup water or chicken broth in the pressure cooker.2. 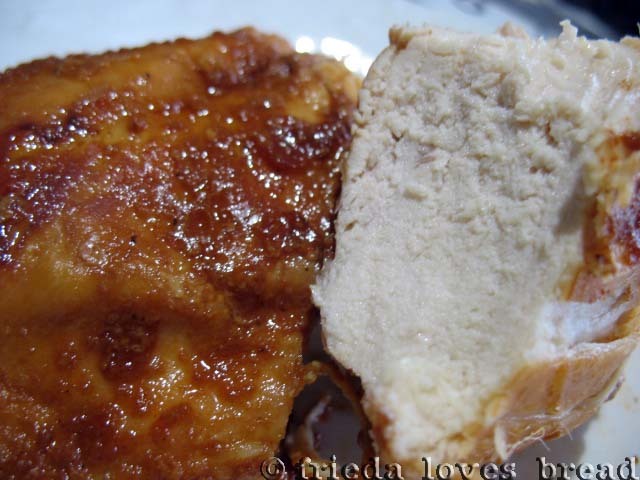 Place the frozen chicken in a single layer, not overlapping, if possible.3. Pour BBQ sauce and honey on top of chicken.4. Close the lid and pressure valve.5. Select HIGH pressure and the time according to the chart.6. When cook time ends, use the NPR recommended on the chart. 7. At the end of the NPR, open the pressure valve to release any remaining pressure. 8. Open the pressure cooker, remove the chicken, and enjoy! Test your chicken with an instant read digital thermometer. Internal temp of your chicken should read at least 165°F.Enjoy your chicken whole, or shred it and mix in with the remaining sauce. So glad you posted this. I've been wondering how long it would take to cook frozen chicken breasts to use in recipes and how much liquid I would need to use. Great idea to use BBQ sauce. Thanks for the link love! Thanks, Barbara! My friend told me that the frozen chicken has plenty of liquid in it, so it can work without any BBQ sauce, if you choose. You two inspired me to go out and buy the Cuisinart pressure cooker. I've only used it once and am dying to use it again. Love the chicken recipes and all of them. Keep 'em coming. Woo hoo! Bonnie, that's great! Hi Barbara. The photos are lovely, they make me hungry:) The side of the chicken that touched the bottom of pot looked even better than the top, you're right at that. 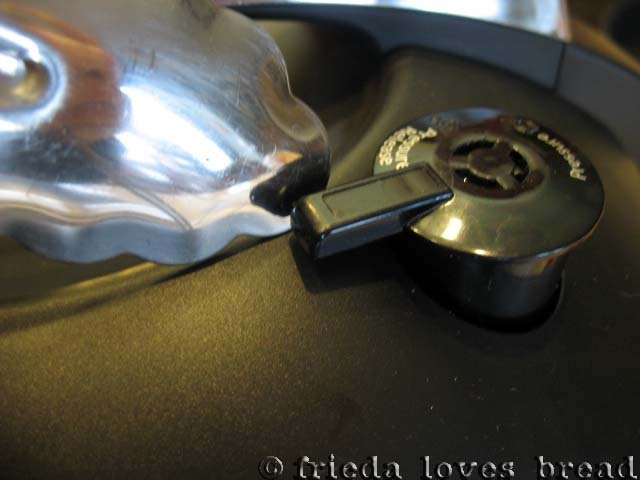 I have had my share of experiences with my Fissler pressure cooking too, and I agree with everything you said. Thanks for all the added info. I love the thunk thunk part!! Made me laugh. Thanks for sharing. My MIL got me an electric PC for christmas and I've only used it once. This will be a great recipe for me since I am often at work thinking "dang I didn't take anything out for dinner!". Thanks! I tried this recipe last night with KC Masterpiece (all I had) and no honey. I cooked it 12 min. and did a quick release. The results were great! The chicken came out at about 175 F (slightly overcooked?) but was still very nice and tender and the resulting sauce was great! I ate it with some brown rice and baby bok choy and it was great (though I'm not sure baby bok choy is a good pairing). Thanks for recipe! I will be trying it in the future with frozen chicken thighs! You are welcome! I agree, 175° is slightly overcooked, and there are a couple of variables: how many pieces you put in and how long you cook it. Now you have your baseline for future chicken recipes! I was very glad to find a few posts about the Cuisinart electric pressure cooker! I really appreciate knowing how to even use frozen stuff without thawing. You know, if you hadn't used the word "thunk" I would have a hard time finding this page every time I need it. Google tries to correct me 'you meant think, right' but once I'm past that I find it again! 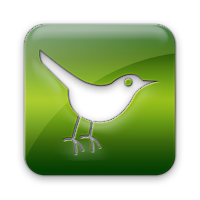 (I do have it bookmarked somewhere, but who knows on which device.) Thanks again! Just made this for my boss, he didn't believe it would happen. 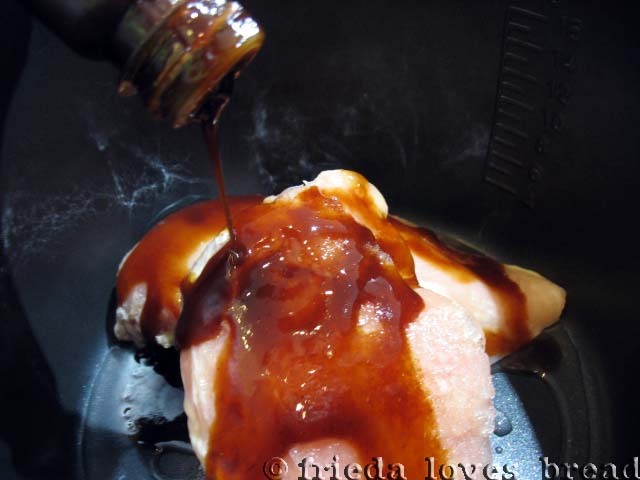 Three completely frozen chicken breasts, BBQ sauce and a couple of tablespoons of honey and voila. Amazing. Thanks for sharing!! He and I were talking about that. I would say virtually everything is on the table as they make so many different bottled sauces now. You could even, I would surmise, use salad dressings (although maybe stay away from the more oily ones). I can't imagine how this wouldn't also be an excellent way to use cream of (insert something) soups, the flavor would just sink in and you'd have a wonderful cream type sauce at the end to spoon over the chicken and whatever accompaniment you desired. I just got my pressure cooker a month ago and can't stop using it!! I've had to do some experimenting as well...did you use a stovetop pressure cooker? That's the nice thing about this electric one...it turns off if there is little or no liquid in the pan or if there is too much. Take good notes, keep trying and let me know the results. Good luck! Yes, I sort of inherited an older stove top pressure cooker. I've tried other meals that turned out surprisingly well. I had a feeling I should have added a little water to the pot. Should have gone with my gut feeling. There was definitely potential for being good. Thanks! I don't know if this comment fits here or not, but my very favorite steaks are Chuck steaks cooked in a pressure cooker for 15 minutes at low pressure.The come out tender and dropping off the bone and so delicious. They come out so faboulous, that I have served them to some very discriminating grandchildren with great success. I love it when my readers share their thoughts, suggestions and comments. 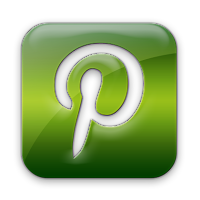 You are welcome to share any time! I will have to try your chuck steak suggestion. Do you season it with anything prior to cooking or put it on a rack in the pressure cooker?